When 1 in 7 people are going hungry in a country that throws out half the food it produces, there isn’t a supply problem; there’s a distribution problem. This was part of the hypothesis tested in a 2011 study conducted by former University of Colorado students Caleb Phillips and Becky Higbee. By looking at data collected through a local food rescue organization, the study found that large volumes of food were going to waste in northern Colorado because there wasn’t a well-coordinated effort capable of catching that food before it became completely unusable. The research team showed that, with funding and adequate labor, organized food rescue and redistribution efforts were not only possible at small and large scales, they could also capture enough potentially wasted food in Boulder and Broomfield Counties to feed everyone in that area. On the wings of this information, Phillips and Higbee joined with friends Nora Lecesse, Helen Katich, and Hana Dansky to form Boulder Food Rescue. The project began with the same systems-minded approach as the study. The BFR crew met with local grocery store officials, whose stores were trashing unsold food, and asked why they wouldn’t choose to donate it instead. Some blamed the rules of local food banks, which prohibited donations of produce outside of its original packaging. Many more grocery managers lamented that food gone past a supermarket’s saleable standards is too perishable to survive the extended journey from store to food bank to plate. As the study had already shown, timing was key. Store managers at Boulder’s Ideal Market agreed. But they also supported BFR’s fledgling mission and wanted to help do something about it. So managers and the BFR team co-developed a scheme that helped store staff and BFR’s rescue crew coordinate to make sure the perishable food coming off grocery store shelves could be picked up and transported the minute it was available. This “just-in-time” model leveraged precise schedules to diminish or eliminate the need for storage time between pickup and delivery, getting the food onto plates within 24 to 48 hours. The group also focused on logistics that made the new routine as easy as possible for grocery workers, such as BFR providing the boxes used for transport, and having the boxes located closer to produce departments than the trash. With a workable system in place, BFR needed to figure out how to actually move the food it was going to rescue and, with sustainability in mind, the group wasn’t about to pick all this food up in a semi-truck. The organization cultivated a fleet of bicycles and bike trailers pedaled by volunteers to get the food from A to B. 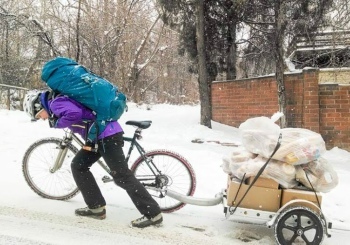 Five years after getting started, the pedal-powered rescue crew makes about 15 pickups per day, seven days per week, from a variety of stores and restaurants. Through this simple if sweaty method, BFR has rescued nearly 1.3 million pounds of food, mostly produce and baked goods, with apples, tomatoes, bananas, potatoes, and bread being some of the most common items. Initially this food was bound for a free public meal, delivered in partnership with the grassroots Food Not Bombs network. Today, that attitude of taking food directly to those who need it has lead to a diversified network of 40 recipient sites that includes daycare centers, senior housing sites, and low-income housing developments. Going even further, BFR encourages its recipient sites to become part of the direct services infrastructure themselves by using BFR deliveries to set up their own “Grocery Programs,” organized on-site distributions modeled after those at food pantries. By these measures, BFR has been a resounding success. But keeping up with the pace of the success hasn’t always been easy for the mostly volunteer organization, funded primarily by grants and individual donations. BFR is also looking to its donors as crucial partners who help keep the project’s rhythm consistent. By counting on its existing partnerships and seeking new ones with other food redistribution agencies and waste mitigation agencies, BFR hopes to continue to grow its impact on a shoestring. The organization is also positioning itself as a catalyst for food rescue projects in other places by publishing a logistics and tracking app designed to automate program management, as well as The Package Deal, a DIY kit for starting a bike-powered food rescue project. It’s this constantly evolving aspect of BFR’s mission that’s kept four out of the five co-founders of the project involved. And it’s also what’s helped salvage 10 boxcars worth of food in a few short years and improve the nutrition of food being served to those in need.